Picture your dream hamburger. But not as you know it now -- go back to something like the early '90s, when words like "arugula" and "house-made truffle aioli" were utopian fiction. A time when a greasy burger with American cheese and iceberg lettuce, served on checkered paper in a ramshackle building decorated with movie posters and arcade games, wasn't some kind of ironic "throwback." That's what Burger Time Machine in Denton is selling -- a living memory of the classic roadside burger joint, one bite at a time. It would be difficult to talk for long about Burger Time Machine without mentioning the appearance of its building, which looks like a Hollywood Video stuffed inside a methadone clinic. 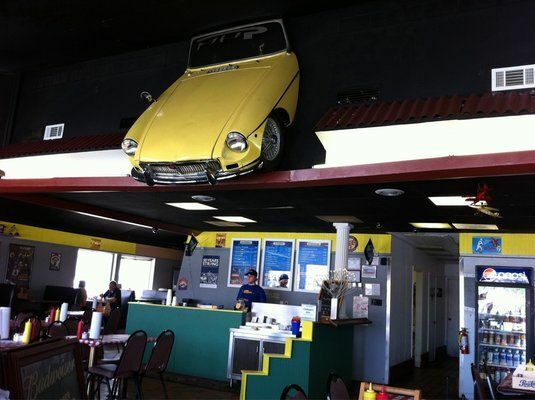 The interior is decorated with 1980s movie posters, a pool table, arcade games and the front half of a yellow MG Roadster crashing through the ceiling for reasons unknown. Menu items include burgers named for Star Wars and Planet of the Apes -- the latter featuring fried bananas, natch -- and something called the "Terminator Hot Dog." It's a stretch to say the place is actually dirty, but you'd be lying to yourself by describing it as anything but a dive. (On a related note, if you've gone on more than one date here with your significant other, stop reading now and go ask them to marry you.) But the restaurant's appearance is terrific cover, keeping it under the radar just enough for you to blow all your friends' minds when you finally drag them kicking and screaming through the door and introduce them to the glory that awaits within. Just because Burger Time Machine makes the best classic hamburger in Denton doesn't mean it's completely stuck in the past. Trendier topping options like fried eggs, peanut butter, pineapple slices and tangy Korean bulgogi grace the menu, and they're all delicious. But you gotta crawl before you ball, so start with the 1/4 pound Galaxy Burger, topped simply with American cheese, lettuce, grilled onions and those circular dill pickle chips that will inevitably remind you of a Memorial Day cookout. The Galaxy Burger alone will run you $4.95, but for $2.75 extra you can walk away with hand-cut fries and a drink. The fries are good, as fried things tend to be, but if you're really looking for the classic diner experience it's worth upgrading to tater tots or onion rings. The onion rings are probably the second best item on the menu after the burgers themselves, thickly breaded beer-batter style and big enough to hurl like a discus at any jabroni who tries to steal a bite. But stop thinking about the accessories for a minute, because this burger is going to require serious poetic attention. The patty is juicy and greasy and sloppy in a way that evokes indulgence rather than indigestion, the iceberg lettuce and pickles are crunchy and cool, the grilled onions are diced to the perfect size and the buns are pillow-soft yet sturdy enough to maintain their structural integrity under a load of hot beef and melted cheese. Nothing about the joint's semi-seedy appearance or hokey Sci-Fi menu trappings could prepare you for how astonishingly delicious the final product really is -- it's truly an anomaly in the best possible way, the most outstanding burger in Denton by an almost embarrassing margin. There's a good chance every employee has a deal with the devil filed right next to their W-2s, and knowing that wouldn't stop me from eating here. The only way to improve upon the marvelous simplicity of this burger without dipping into the menu's more exotic options is an upgrade to the 1/2 pound Time Machine Burger, which, along with the Galaxy Burger's toppings, adds grilled mushrooms and jalapeños into the mix. But good luck throwing that back with a side of fries and exiting the building under your own power, champ.